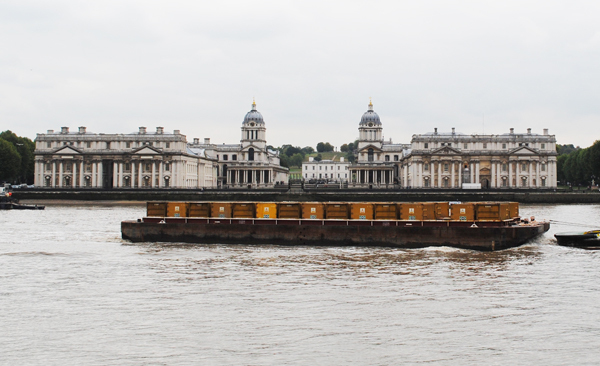 For the final in our series of memorable (and historic) views of London, we’re returning to Greenwich, except this time we’re looking across the River Thames from the southern end of the Isle of Dogs at some of the historic buildings of maritime Greenwich. The splendid view from Island Gardens on the north bank of the Thames today reveals Sir Christopher Wren’s Old Royal Naval College, the Queen’s House and beyond that the Royal Observatory in Greenwich Park. But it wasn’t always so. Prior to its demolition by King Charles II in 1660, this was the site of a royal palace known Greenwich Palace or the Palace of Placentia which had occupied the site since the mid-15th century (and was rebuilt by King Henry VII in the late 15th/early 16th centuries). Charles decided to demolish it to build a new palace on the site but only a section of it was ever completed and it was never used as a royal palace. 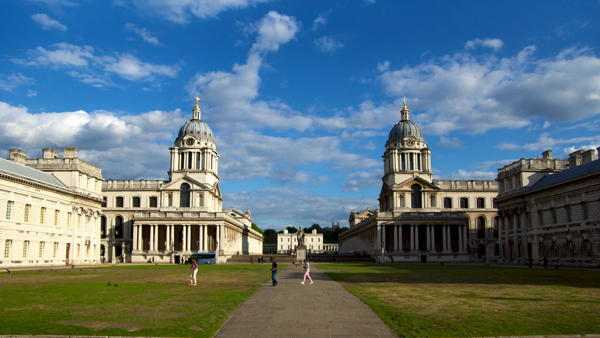 In the late 17th century, Greenwich Hospital – incorporating what was built of Charles’ palace – was constructed on the site as a home for retired sailors from the Royal Navy. From 1869, it was used as the Royal Naval College and now houses a range of organisations (see our previous post here for more). The Queen’s House, which lies at the centre of the view, was designed by Inigo Jones and started on the orders of Anne of Denmark, wife of King James I. But it remained unfinished when Queen Anne died in 1614 and it was Henrietta Maria, wife of King Charles I, who completed it. The house these days serves as a gallery (for more, see our earlier post here). Behind the Queen’s House can be seen the Royal Observatory, home of Greenwich Mean Time and the Prime Meridian (see our previous post here) – as well as, of course, the (previously aforementioned) statue of General Wolfe. Also in the modern view from Island Gardens is the Cutty Sark and the National Maritime Museum. It’s believed that the view from where Island Gardens now stands is that replicated in Canaletto’s painting, Greenwich Hospital from the North Bank of the Thames (although, oddly, whether Canaletto ever actually visited the site is apparently a matter of some dispute). Greenwich Park and the buildings on the other side of the river can be accessed from the park Island Gardens by the Greenwich Foot Tunnel. WHERE: Island Gardens on the north bank of the River Thames (nearest DLR is Island Gardens); WHEN: Anytime; COST: Free; WEBSITE: (For Greenwich Park across the river – www.royalparks.gov.uk/Greenwich-Park.aspx).